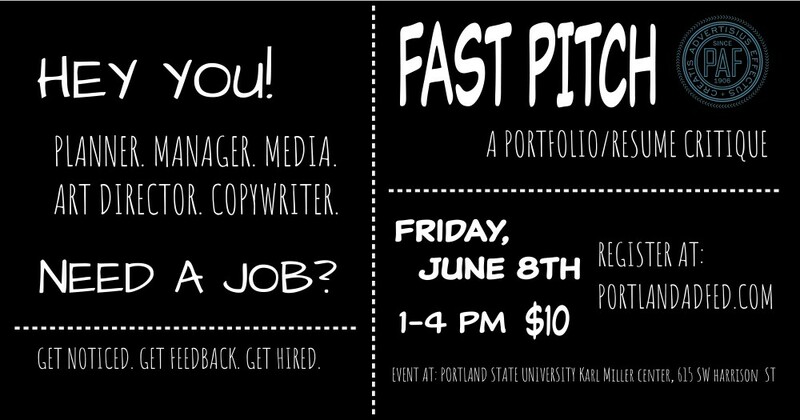 The Portland Advertising Federation is hosting their annual Fast Pitch Event on June 8th. Taking place at your very own Karl Miller Center, this event is for students who are about to graduate and embark the journey of the job hunt. Organized by two recent graduates, we know more than anyone that getting that first job is hard, and getting honest feedback is even harder. Fast Pitch is designed to alleviate both of those problems by giving students an easy-in with local professionals. For $10 students get to spend an hour chatting with local advertising professionals getting one-on-one face time, showing off their book, and making an impression. It’s all about building connections and giving soon-to-be-grads a way to dip into the local advertising scene. Register HERE! We have representation from every profession, so whether they’re an art director, designer, artist, or something in-between, students of every discipline should be able to connect with someone relevant to their future job. Most of all, this is about feedback. Students can show off all of their recent work, hone their pitches, and adjust their books based on honest feedback from someone with real experience.